I love this recipe, the “MIL” sent us out some arancini from the restaurant last night and I had a couple of bags of spinach which I had picked up in Lidl yesterday for spinach soup but decided on this instead. It’s really good on bruschetta too or with some crusty bread, you decide! heat the olive oil in a pan and cook the onions and garlic over a low heat for about 10 mins until soft but not coloured. add your chilli and cook for 1 min. add your beans and some stock, season and leave to simmer for about 10 mins. 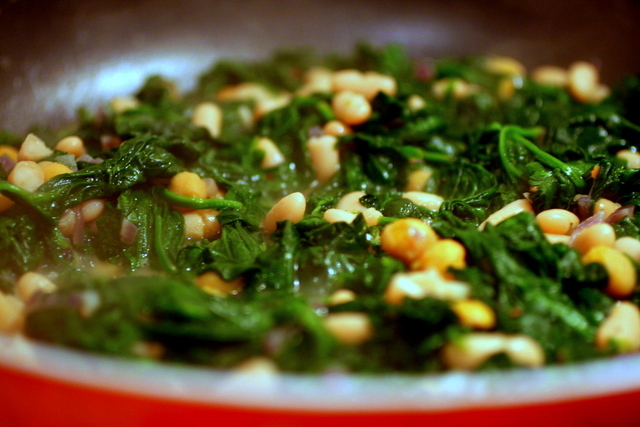 in a dry pot cook your spinach until wilted. Squeeze out excess water. 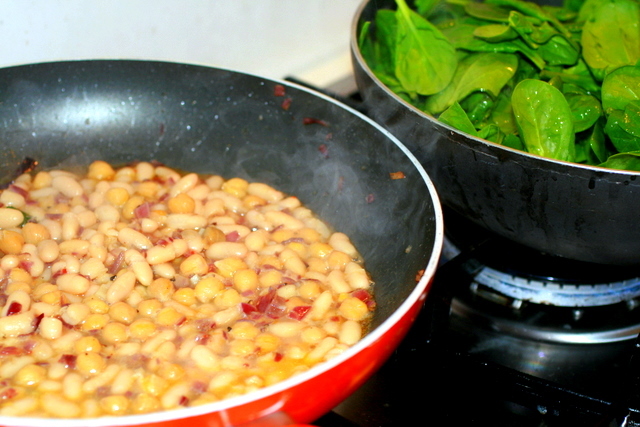 add your spinach to your beans, season, mix together and serve. Oooh this looks gorgeous. I made my own arancini for the first time over the weekend, they made me sooooo happy. If a little plumper. Totally worth it. So, two really useful recipes for me from your blog today, hurray! Actually, we just had your Cannellini Beans with Tomato and Sage (http://italianfoodies.ie/2009/01/07/cannellini-beans-with-tomato-and-sage/) with Parmesan crusted Rack of Lamb this evening… and it was lovely. I saw them the other day Aoife, very impressive. I always take the lazy route and boil the rice even though I’d say they’re much nicer doing it properly. They take a bit of time don’t they? I haven’t made them in a long time. This dish is lovely with a piece of meat too…..
No problem Dave, glad you liked it. This recipe is really good too! I like the sound of that parmesan lamb…. 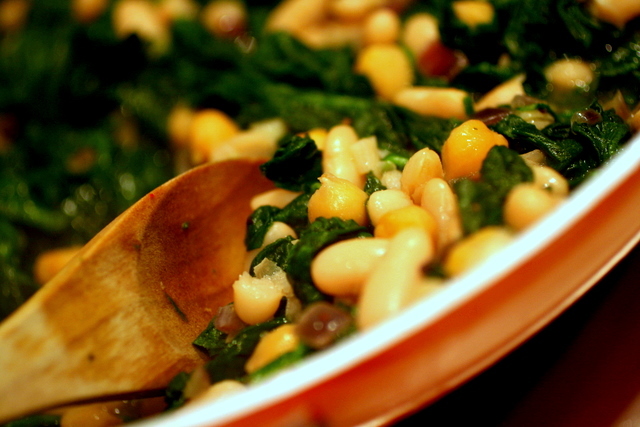 spinach and white beans…two of my favorite things. How come I’ve overlooked your blog for so long?? Very, very remiss of me, and I’ll aim to do MUCH better in 2010. 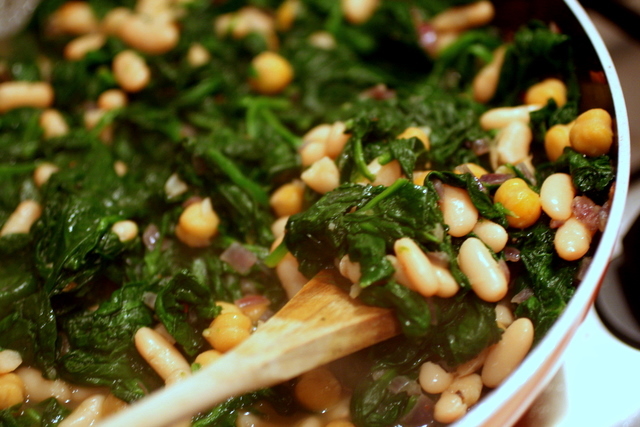 My timing’s spot on for once, too – anything to do with spinach and beans gets my vote. This combination sounds simply delicious. Perfect – I cooked up a pot of mixed beans rather aimlessly this evening, not sure what to do with them (other than the bog standard adding tinned tomatoes and seasoning to death) so this will be dinner tomorrow night. An Italian Foodie Lunch « I Can Has Cook?